The first Chestnut Street Theatre (originally named the New Theatre) was often referred to as one of the Seven Wonders of America. Begun in 1794, the georgian building which was modeled after the Theatre Royal in Bath, England, wasn't completed until 1805. In 1816 it became the first American theatre to be illuminated by gas fixtures rather than candlelight or oil lamps. Four years later, however, the building along with its library, scenery and costumes was destroyed by a suspicious fire. 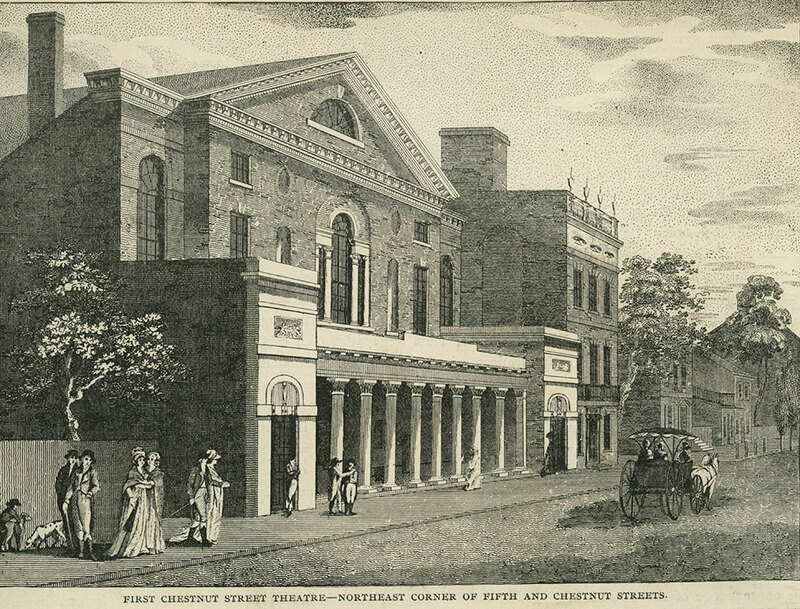 The image, c.1820, shows the theatre's Chestnut Street facade, along with well-dressed citizens and a canopied horse-drawn carriage.